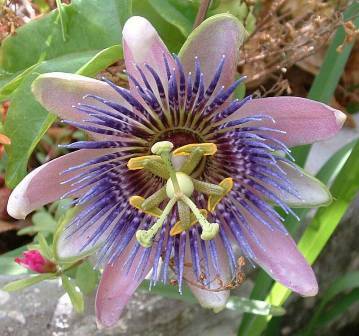 Passionfruit is native of Brazil. In India, it grows wild in the Nilgiris, Wynad, Kodaikanal, Shevroys, Coorg and Malabar. Recently, its cultivation has been extended to some areas in Himachal Pradesh, Nagaland and Mizoram. The juice of passion fruit which has excellent flavour is quite delicious, nutritious and liked for its blending quality. It is extensively used in confectionery, and preparation of cakes, pies and ice cream. A rich source of vitamin A, it also contains fair amount of sodium, magnesium, sulphur and chlorides. 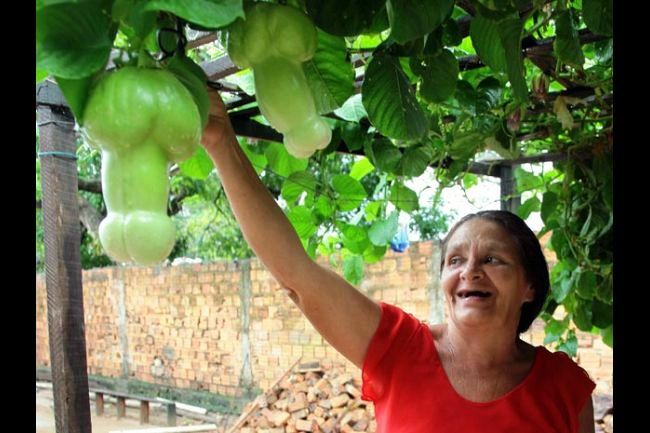 It is a perennial climber, cultivated in the tropics. Flowers are borne singly in the axils of leaves at the terminal region of new growth. The vine, bears hens egg sized fruits in abundance. They are smooth, avoid and purple yellow on ripening. The rind shrinks afterwards and becomes wrinkled. The rind is bordered by white pith, and inside small, hard, black seeds are surrounded separately by a soft, slightly acid, fragrant and juicy orange yellow pulp. It prefers tropical to subtropical climate and grows well up to 2,000 m with a rainfall of 1,000-2,500 mm annually. It can grow in light sandy loam to heavy loam soils with a pH of 6-7. Soils should be well drained. carotenoid pigments. The fruits of purple variety are susceptible to collar rot, wilt, brown leaf spot, thrips and nematodes, while those of yellow have field tolerance. Kaveri, a hybrid of purple x yellow, is high yielding, tolerant to resistant to collar rot, wilt, brown leaf spot and nematodes. Noesl special, a cultivar, is tolerant to Alternaria passiflorae. It is precocious and can bear even at one year’s age, but is self incompatible and needs a pollinator for satisfactory fruitfulness. It is propagated by seeds, cuttings, and grafting on a resistant rootstock. The Tropical American species –P. alata and, P. ambigua, P. cincinata, P. guazumaefolea, P. molliformis, P. mucronata, P. nigradenia, P. nitida, P. riparia, P. seemani, P. serratifolia and P. serrato digitata, – are good rootstocks. Seedlings or grafted plants are more vigorous than cuttings. Propagation by seed should be avoided as it induces variability. Cuttings 30-35 cm long having 3 nodes obtained from selected mature vines are raised on suitable media. Rooting takes place after about a month. They can be transplanted to the main field after 3 months. Maintain a spacing of 3m from plant to plant and 2m from row to row. The best time for planting is during the monsoon. Skilful trellising is quite important in regulating yield as it has to support a considerable weight for 5 years. 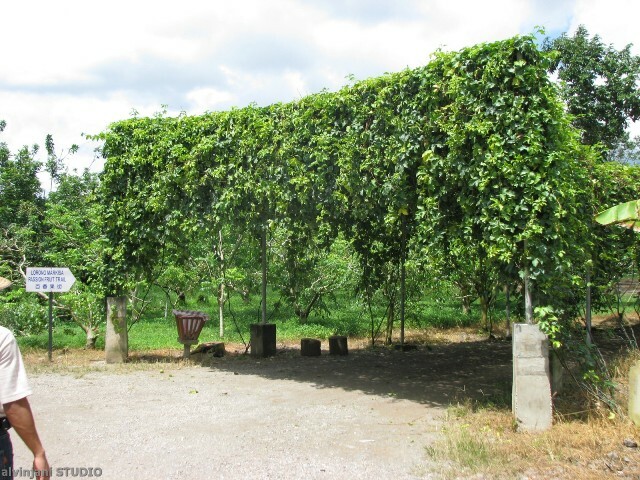 Weak and faulty construction of trellis may result in sagging and loss of vines. Two arm kniffin system is ideal. The trellis should always run across the slope or in north south direction to facilitate even exposure to the sunlight. Once the vines reach the wire, the tips are pinched to facilitate leader formation. Two leaders are directed on either side of the wire in opposite direction which in turn develop laterals. These laterals are trained downwards hanging from the wire and form the fruiting area of the vine. 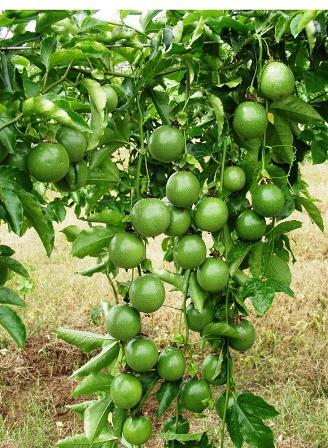 Since passion fruit vine bears fruits only on current season’s growth, systematic pruning encourage new growth. Pruning should be done after harvesting the crop in April and November-December. It is done by cutting back of laterals to the nearest active bud as otherwise with increase in age of the lateral, the basal buds become dormant or sterile. Indiscriminate and drastic pruning of inactive or dormant vine may lead to a setback in growth, resulting in lower yield. Application of 100, 50 and 100g N, P2O5 and K2O per vine annually in 2 splits for purple and 110, 60 and 100 g N, P2O5 and K2O/ per vine/year for Kaveri is optimum. During prolonged dry spell (January-March), it should be irrigated at fortnight intervals, otherwise the development of flowering laterals is adversely affected. 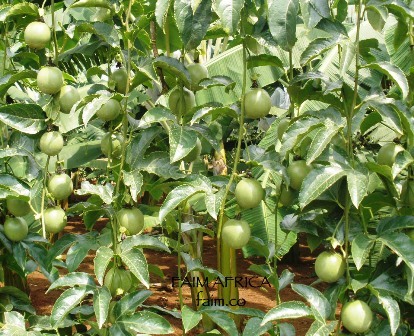 The fruits are obtained from the 10th month and full bearing reaches by 16-19 months. Although its plants flower and provide fruits throughout the year, there are 2 main periods of fruiting from August to December and March to May. About 80-85 days are required from fruit set to harvest. The ripe fruits fall down from the vine. Slightly purple coloured fruits along with a small portion of the stem should be picked up. Purple variety yields 8-10 kg/ vine, whereas Kaveri 16-20kg/vine, the total yield being12-20 tons/ha annually. The fruits should be disposed off quickly to prevent loss in weight and their appearance. Storing them in polythene bags, however, reduces this problem to some extent. A number of processed products- nectar, squash, carbonated drink and juice concentrate-could be prepared. These products are in great demand both in domestic as well as export market. There are possibilities even for fresh fruit export which remains unexploited.